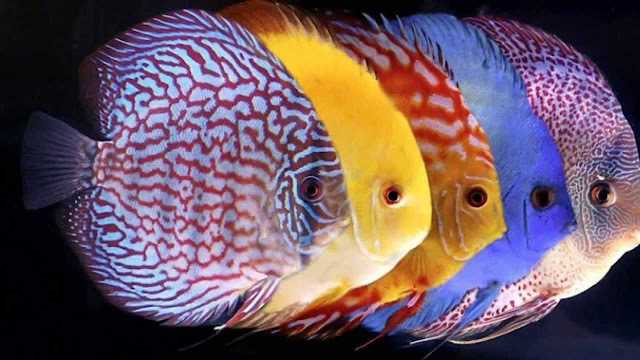 Multiple colours of discus in aquarium. 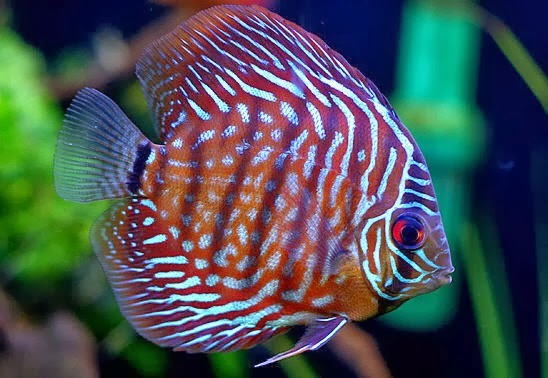 Symphysodon or more popular known as discus is one of the most popular aquarium freshwater fish for since long time ago. This explained why there are so many varieties of discus in the market to make sure there always new characteristic introduce into the market every year. Discus originally native to Amazon River basin is actually part of cichlids genus. Today most of the fish breed and live in the aquarium. Not like gourami that little tougher to water condition and diseases, discus is more sensitive and considered as ‘fragile’ fish. It’s not suitable for starting your aquarium hobby – unless you already started with few other easier to keep fishes for some period of times. Anyway for some qualities this fish has, you might want to try to keep it in your aquarium at some points. Wide varieties of colours and patterns. 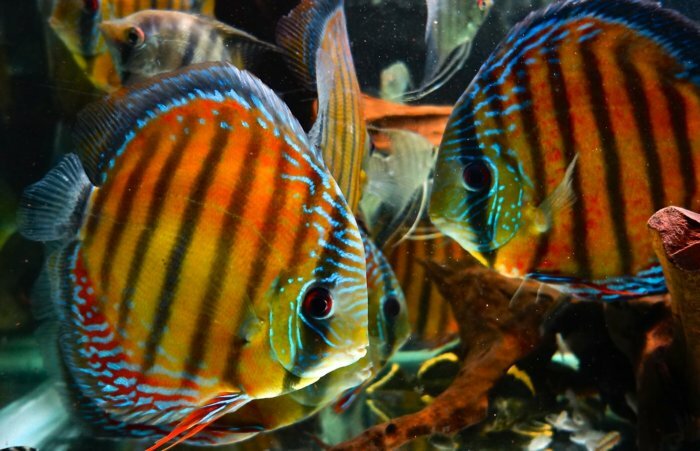 There are three main species of discus; Symphysodon aequifasciatus (blue), Symphysodon discus (red), and Symphysodon tarzoo (green). Anyway by selective breeding, aquarist successfully produced many varieties of colours for this fish. 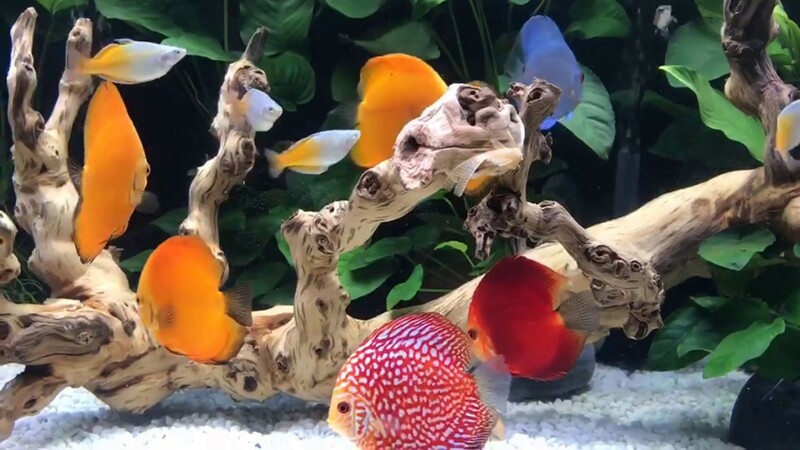 So there are many beautiful discus fish you can keep - if you like to see all of these beautiful colourations and patterns. As any other cichlids discus has thinner body from the top, but flatter and beautifully almost round from the side. 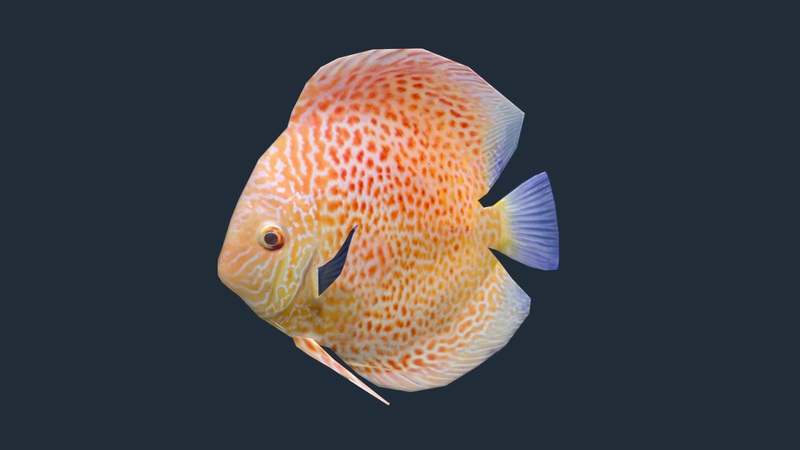 This shapes rarely found in freshwater fish, that’s another reasons why discus become so popular. Discus also has patterns on its scales. As mentioned before, they are many new patterns produce by aquarist all over the year. Discus behaviour itself is wonderful to watch. It’s highly social behaviour and prefer to be in groups up to dozens of individuals and only separate itself from the group during the breeding season. Discus will take care their young for the first four weeks. They also will secrete a mucus for their young to feed on. For all that reasons, discus still maintain itself as popular aquarium fish for so many years. Let see some of the varieties of discus. More details of this fish will be included in the future articles. Bright colours and stunning patterns. Another beautiful breed of discus. Selective breeding make this colours possible.